For other uses, see God Bless America (disambiguation). In 1938, with the rise of Adolf Hitler, Irving Berlin, who was Jewish and had arrived in America from Russia at the age of five, felt it was time to revive it as a "peace song," and it was introduced on an Armistice Day broadcast in 1938, sung by Kate Smith on her radio show. Berlin had made some minor changes; by this time, "to the right" might have been considered a call to the political right, so he substituted "through the night" instead. He also provided an introduction that is now rarely heard but which Smith always used: "While the storm clouds gather far across the sea / Let us swear allegiance to a land that's free / Let us all be grateful for a land so fair, / As we raise our voices in a solemn prayer." (In her first broadcast of the song, Kate Smith sang "that we're far from there" rather than "for a land so fair".) This was changed when Berlin published the sheet music in March 1939. Woody Guthrie criticized the song, which he considered unrealistic and complacent, and in 1940 he wrote "This Land Is Your Land," originally titled "God Blessed America For Me," as a response. Anti-Semitic groups such as the Ku Klux Klan also protest the song due to its authorship by a Jewish immigrant. In 1943, Smith's rendition was featured in the patriotic musical "This is the Army" along with other Berlin songs. The manuscripts in the Library of Congress reveal the evolution of the song from victory to peace. Berlin gave the royalties of the song to 'The God Bless America Fund' for redistribution to Boy Scouts and Girl Scouts in New York City. Smith performed the song on her two NBC television series in the 1950s and in her short-lived The Kate Smith Show on CBS, which aired on CBS from January 25 to July 18, 1960. 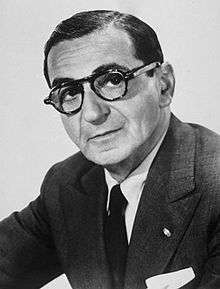 "God Bless America" also spawned another of Irving Berlin's tunes, "Heaven Watch The Philippines," during the end of World War II after he heard the Filipinos sing a slightly revised version of the song replacing "America" with "The Philippines." The song was used early in the Civil Rights Movement as well as at labor rallies. During the 1960s, the song was increasingly used by Christian conservatives in the US to signal their opposition to secular liberalism and to silence dissenters who were speaking in favor of communism or in opposition to the U.S. involvement in the Vietnam War. Later, from December 11, 1969, through the early 1970s, the playing of Smith singing the song before many home games of the National Hockey League's Philadelphia Flyers brought it renewed popularity as well as a reputation for being a "good luck charm" to the Flyers long before it became a staple of nationwide sporting events. The Flyers even brought Smith in to perform live before Game 6 of the 1974 Stanley Cup Finals on May 19, 1974, and the Flyers won the Cup that day. "America" was the official campaign song for Franklin Delano Roosevelt in 1940, as well as his Republican opponent, Wendell Willkie. At that time, the song represented cultural and religious tolerance. During a live television broadcast on the evening of the September 11, 2001, terrorist attacks, following addresses by then House and Senate leaders Dennis Hastert and Tom Daschle, members of the United States Congress broke out into an apparently spontaneous verse of "God Bless America" on the steps of the Capitol building in Washington, D.C.
On July 21, 2011, Smith's version of the song was played as NASA's final wakeup call for the space shuttle Atlantis (STS-135), capping the 30-year shuttle program. At some Flyers' home games, especially during big games and the playoffs, their main anthem singer, Lauren Hart, has sung "God Bless America" alternating lyrics with Kate Smith on a video screen. Kate Smith actually appeared in person to sing at select Flyers games, including their 1974 Stanley Cup clinching game against the Boston Bruins, to which she received a thunderous ovation from the passionate Philadelphia fans. Before games whenever "God Bless America" is performed, Lou Nolan, the PA announcer for the Flyers at the Wells Fargo Center, would say: "Ladies and gentlemen, at this time, we ask that you please rise and remove your hats and salute to our flags and welcome the No. 1 ranked anthemist in the NHL, Lauren Hart, as she sings (if the visiting team is from Canada, O Canada, followed by) God Bless America, accompanied by the great Kate Smith." At some Senators home games since 2000–01, if the visiting team is from the U.S., their main anthem singer, Ontario Provincial Police Constable Lyndon Slewidge, has sung "God Bless America" and "O Canada." An example of this came during the Senators' home opener during the 2002-03 season, when they were home against the New Jersey Devils. During Tom Golisano's time as owner of the Buffalo Sabres, the team occasionally substituted "God Bless America" for "The Star Spangled Banner" during certain special events. When this occurred, Ronan Tynan was brought in to sing the song while usual anthem singer Doug Allen sang "O Canada." At Chicago's Wrigley Field during the Vietnam War, the song was often played by the organist as part of his postgame playlist while fans filed out of the stadium. Since the September 11, 2001, terrorist attacks, "God Bless America" is commonly sung during the seventh-inning stretch in Major League Baseball games, most often on Sundays, Opening Day, Memorial Day, Independence Day, All-Star Game, Labor Day, September 11, and all post-season Major League Baseball games. Following the attacks, John Dever, then the Assistant Media Relations Director with the San Diego Padres, suggested the song replace "Take Me Out to the Ball Game", the more traditional 7th inning anthem. MLB quickly followed the Padres lead and instituted it league-wide for the rest of the season; presently, teams decide individually when to play the song. Yankee Stadium, and Turner Field are currently the only Major League ballparks to play "God Bless America" in every game during the seventh-inning stretch. The Yankees' YES Network televises its performance during some (mainly home) games before going to a commercial. During major games (playoff contests, Opening Day, national holidays, or games against Boston or the Mets), the Yankees will often have Irish tenor Ronan Tynan perform the song. On August 26, 2008, at a Boston Red Sox game at Yankee Stadium, a fan who had attempted to leave for the restroom during the playing of the song was restrained and subsequently sent out of the building by NYPD officers. Part of the resolution of the resulting lawsuit was that the New York Yankees announced that they would no longer restrict the movement of fans during the playing of the song. On September 15, 2009, three high school teens filed a lawsuit against New Jersey's minor league Newark Bears for being ejected from Eagles Riverfront Stadium over their refusal to stand during the playing of "God Bless America" on June 29, 2009. Before being ejected, they were asked to leave the stadium by Bears president and co-owner Thomas Cetnar. To honor the start of the United States Bicentennial, Kate Smith sang "God Bless America" for a national television audience, accompanied by the UCLA Band at the 1976 Rose Bowl. The Indianapolis 500 is traditionally run at the end of the month of May, and "God Bless America" has been sung there since 2003. The song "America the Beautiful" was sung before, but it was switched to "God Bless America" in the post-9/11 era. The song has traditionally been performed by Florence Henderson, a native Hoosier, and is a friend of the Hulman-George family, the track's owners. Her performance, often not televised, immediately precedes the national anthem. Henderson routinely sings the entire song, including the prologue, and in some years sings the chorus a second time. Following the September 11 terrorist attacks, Canadian pop star Celine Dion performed the song on the TV special America: A Tribute to Heroes. Shortly afterwards on October 16, Sony Music Entertainment released a benefit album called God Bless America, which featured Dion singing the song. The album debuted at No. 1 on the Billboard 200 and became the first charity album to reach the top since USA for Africa's "We Are the World" in 1985. Dion's version also received enough radio airplay to reach No. 14 on Billboard's Hot Adult Contemporary Tracks chart. The music video was made and aired in September 2001. Dion performed the song also a few times during 2002. In 2003, she performed it at Super Bowl XXXVII, which was the first time that "God Bless America" was performed at a Super Bowl. She sang it on July 4, 2004 in her A New Day... show as well. "God Bless America" performed by Dion exists in two versions, live and studio. Both included on collections to gather funds for the victims of the terrorist attacks of September 11, 2001, and their families. The live version, on America: A Tribute to Heroes, is from the telethon event of the same name that took place on September 21, 2001. The studio version is on the God Bless America album, a patriotic songs CD. It was recorded on September 20, 2001, the day before the American telethon. It was meant to be a replacement for the performance in the event something happened and Dion couldn't appear. The song was recorded by New York City's "singing cop," Daniel Rodríguez, and charted for one week at No. 99 on the Billboard Hot 100 as a single. Before the 2001 versions, the last time "God Bless America" had been a Billboard chart hit was in 1959 when Connie Francis reached No. 36 with her version (the B-side of her Top 10 hit "Among My Souvenirs"). In 1996 Yiddish singer Leo Fuld recorded a Dutch version of the song as God Bless The Netherlands, that he presented and sang on April 30 to Queen Beatrix of the Netherlands. In 1997, American country music recording artist LeAnn Rimes recorded a cover of the song on her second studio album, You Light Up My Life: Inspirational Songs. After the events of September 11, Rimes rereleased the song on a compilation album by the same name. Rimes also released the song on a CD single. Two versions were released on October 16, 2001. Both versions contain the song as the A-side track, but the B-side tracks were different. One released to the general public was released with the B-side track, "Put a Little Holiday in Your Heart," and the other was released to radio with the B-side track of Rimes's rendition of "The National Anthem." Rimes's version peaked at No. 57 on the Billboard Country Songs chart on October 27, 2001. In 2009 keyboardist Bob Baldwin covered the renowned song from his album "Lookin' Back." The song was sung in the 1943 film This is the Army with slightly modified lyrics. The song was sung by the main characters in Michael Cimino's 1978 war film The Deer Hunter. Regarding the song in the film, Roger Ebert says in his March 9, 1979 review: "It [the film] ends on a curious note: The singing of "God Bless America". I won't tell you how it arrives at that particular moment... but I do want to observe that the lyrics of "God Bless America" have never before seemed to me to contain such an infinity of possible meanings, some tragic, some unspeakably sad, some few still defiantly hopeful". The song is prominently featured in the film Once Upon a Time in America, where it is played during a murder at the beginning of the picture. In the "Flashback: Mike Meets Archie" episode of All in the Family from 1971, after Archie Bunker was disgusted with Mike "Meathead" Stivic's liberal viewpoints, Archie stood up and sang a butchered version of "God Bless America" while Mike was screaming at Archie. The song has spawned numerous parodies. "I am an Anglican" is sung as an Episcopal church camp song. A midwestern version refers to Lutherans, a mid-Atlantic one to Presbyterians. In "Temporarily Humboldt County" on The Firesign Theatre's first album Waiting for the Electrician or Someone Like Him, a group of Native American men briefly and ironically sing "God bless Vespucciland..." to the tune of "God Bless America" as they fade off into the distance. The reference is a play on the name of Italian explorer Amerigo Vespucci, whose first name is the source for the name "America" for the New World. In "How Can You Be in Two Places at Once When You're Not Anywhere at All" on the album with that name, The Firesign Theatre briefly break into lines based on the song: "Ask the postman. Ask the mailman. Ask the milkman...white with foam." God Bless America, a 2011 film by Bobcat Goldthwait, is a dark comedy that satirizes the present-day American values. The story revolves around a loveless, jobless, possibly terminally ill man and his 16-year-old female companion, who go on a killing spree, offing the stupidest, cruelest, and most repugnant members of American society. ↑ "God Bless America and Kate Smith". katesmith.org. 1 2 "God Bless America (Memory): American Treasures of the Library of Congress". loc.gov. Collins, Ace. Songs Sung, Red, White, and Blue: The Stories Behind America's Best-Loved Patriotic Songs. HarperResource, 2003, p. 82-83. 1 2 3 4 5 "From Peace To Patriotism: The Shifting Identity Of 'God Bless America'". Interview of Sheryl Kaskowitz by Robert Siegel. NPR.org. September 2, 2013. Retrieved September 10, 2013. ↑ Michael Alexander (2003). Jazz Age Jews. Princeton University Press. p. 161. ISBN 978-0-691-11653-2. 1 2 3 4 5 "Flyers History - Kate Smith" FlyersHistory.com. Accessed in 2007. ↑ Wendell, Bryan (February 3, 2016). "How the BSA benefits every time you hear 'God Bless America'". Retrieved February 3, 2016. 1 2 Kaskowitz, Sheryl (July 4, 2013). ""God Bless America" and Republicans: How the song became an anthem of conservatives and the Christian right". Slate. Retrieved July 7, 2013. ↑ Jonathan Karl (September 12, 2001). "Congress vows unity, reprisals for attacks". CNN. ↑ Allen, Kevin (March 23, 2003). "NHL Seeks to Stop Booing For a Song". USA Today. Retrieved October 29, 2008. 1 2 "Shots From the Point". The Ottawa Citizen. November 4, 2000. p. F3. Renowned anthem singer Lyndon Slewidge also sounds a bit different, with a new background music accompanying his lyrics to O Canada. He will also substitute God Save America for The Star Spangled Banner on selected occasions. ↑ New Jersey Devils Hockey: New Jersey Devils at Ottawa Senators (radio). New Jersey Devils Radio WABC Talk Radio 77 AM (New York). October 10, 2002. ↑ "Monday's act heroic after 30 years Outfielder recalls protecting country's honor from protesters". chicago.cubs.mlb.com. April 25, 2006. Retrieved April 25, 2006. ↑ ""God Bless America" and baseball, 10 years later". CBSSports.com. August 11, 2011. 1 2 "Atlanta Braves celebrate Opening Night at Turner Field on Monday, March 31". Atlanta Braves. ↑ "MLB Honors Memorial Day". Daily News. New York. ↑ "Baseball plans day of remembrance for 9/11". Major League Baseball. ↑ "NY baseball fan settles 'God Bless America' suit". yesnetwork.com. ↑ "Ex-Yankees 'God Bless America' Singer Ronan Tynan Moves to Boston - Boston Red Sox - NESN.com". NESN.com. ↑ "Yankees Settle 'God Bless America' Case, Won't Restrict Spectators' Movements During Song". nyclu.org. July 7, 2009. Retrieved September 11, 2009. ↑ "Teens Sue Over Minor League Ejection". news.aol.com. September 15, 2009. Archived from the original on September 23, 2009. Retrieved September 15, 2009. ↑ Hooper, Barrett (January 24, 2003). "Man, it feels like a great show". National Post. p. A3. Marc Anthony and Mary J. Blige sang "America the Beautiful", which was also performed at Super Bowl XXXV by Ray Charles and at "Super Bowl XI" by Vicki Carr. This is the first time for God Bless America, which Ms. Dion will perform to a prerecorded music track and to backing vocals by a large choir. ↑ "You Light Up My Life: Inspirational Songs: Leann Rimes: Music". Amazon.com. Retrieved May 6, 2012. 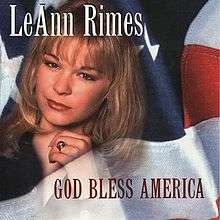 ↑ "God Bless America: Leann Rimes: Music". Amazon.com. Retrieved May 6, 2012. 1 2 "God Bless America / Put a Little Holiday in Your Heart: Leann Rimes: Music". Amazon.com. Retrieved April 29, 2012. ↑ God Bless America/The National Anthem (Promotional CD single). LeAnn Rimes. Curb Records. 2001. D-1631 PRCD#510032. ↑ "God Bless America - LeAnn Rimes". Billboard.com. Prometheus Global Media. Retrieved May 6, 2012. ↑ "Lookin' Back overview". Allmusic.com. Library of Congress page with more information, pictures of manuscript, etc.